Here's our full guide to combat in Monster Hunter World, including controls, and more. Combat with huge beasts is obviously the focus of Monster Hunter World, but there's a lot about combat that isn't properly explained to players. In this Monster Hunter World combat guide, we'll be providing you with a complete overview of the entire system, including tips and tricks, general beginner's advice, and much more. 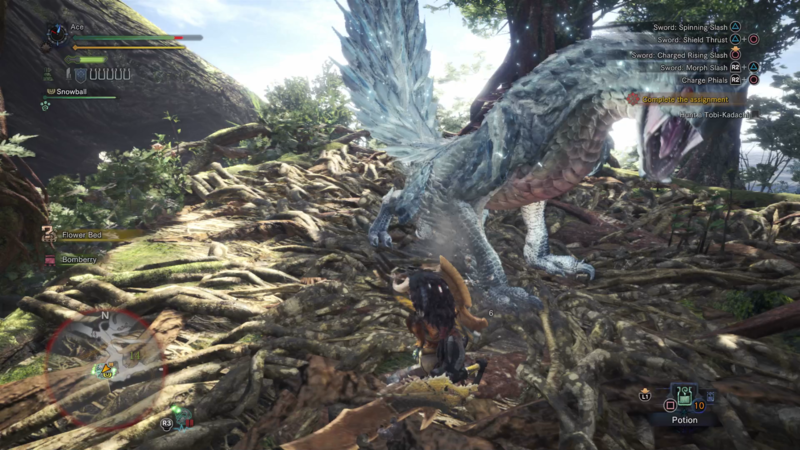 But if you instead need anything else on Monster Hunter World, including how to manage your Palico companion, as well as how to use the Scout Flies to quickly track down monsters, head over to our Monster Hunter World guides walkthrough hub. Combat is what you’re going to spend most of your time undertaking in Monster Hunter World, and just like the rest of the game, it’s crucial that you understand a few key elements before delving headlong into a fight. First, there’s the green and yellow meters on the upper left area of your HUD, with the green representing your health, and the yellow representing your stamina. Should you run out of health due to monster attacks (there’s no fall damage in Monster Hunter World), you’ll faint, and be transported to the nearest Campsite, where you’ll reawaken with all your gear and other items still intact. If you run out of stamina due to sprinting, your character will temporarily stop and gasp for breath, unable to move. This obviously leaves you open to monster attacks, so make sure to never let your stamina entirely deplete. Keep in mind that while the Monster Hunter World combat controls above generally apply to most weapons in the game, there are some exceptions. For example, left trigger won’t do anything for weapons that aren’t ranged or don’t have a shield, such as the Long Sword or Dual Blades. 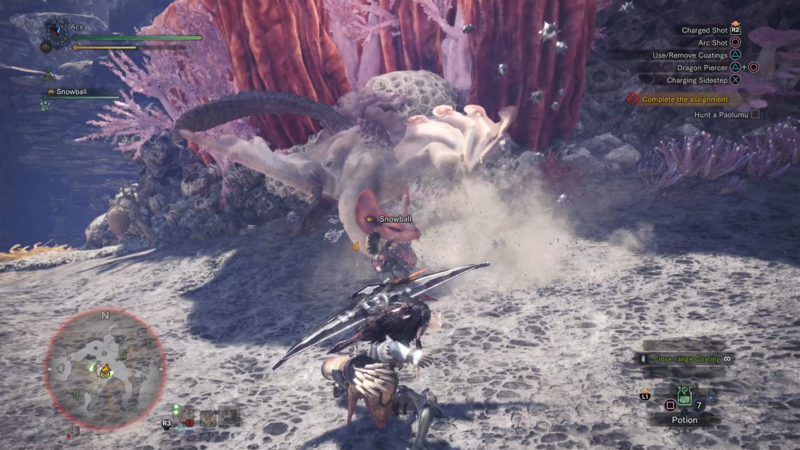 Combat in MHW is a game of dodging and evading your opponent’s attacks, and learning how each monster in the game plays. 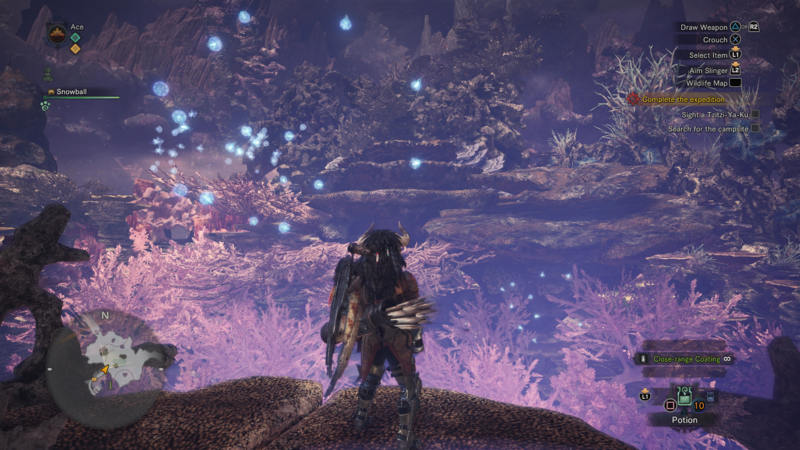 The starting Ancient Forest area is a great tutorial area, where you can practice dodging and evading the attacks of the Great Jagras, generally viewed as the weakest main monster in the game, and commonly found just north east of the starting Camp. Generally speaking, there are two types of monster attacks in Monster Hunter World: standard attacks, and area attacks. Taking the Great Jagras as an example, it can swipe you with its claws, rush you head on, or spit out acid at you, covering an area on the floor. With all monster attacks in the game, you’ll always have some form of warning that they are coming. When the Great Jagras is going to rush you, it’ll visibly pull back and lower its head, while when it’s going to spit at you, it’ll rear its head back in preparation for the attack. Monster Hunter World is all about learning the attack patterns and the attack warnings from the monsters you’re going up against, and taking advantage of them. You’ll want to always leave enough stamina in reserve to dodge out of the way of any incoming attacks, and you’ll also want to press the advantage as soon as an attack is over, using the evade mechanic to close the gap between you and a monster, before backing off to a safe distance. Now that we’re done with this guide explaining the combat mechanics of Monster Hunter World, why not continue to our detailed weapons guide, or our Gathering Hub area guide, both of which will get you up to speed with some essential areas of the complex game.